The launch of Robbins College of Health and Human Sciences began on June 1, 2014, following three years of consultation with the Board of Regents, Deans, faculty, staff, and the Grant Thornton Consulting group. 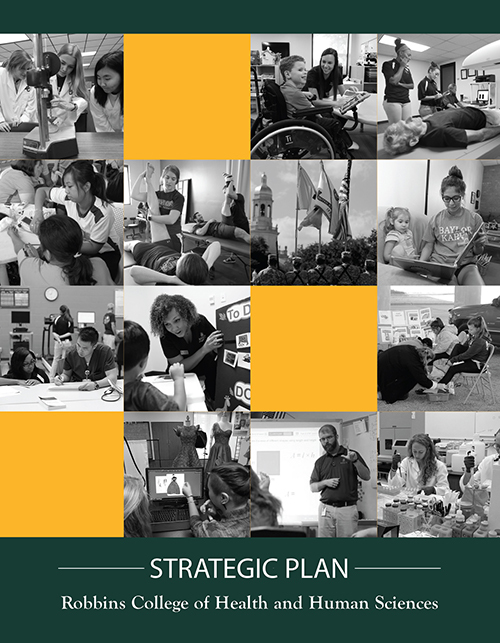 From the beginning, the goal of the Implementation Team of leaders, formed from anchor units - the departments of Health, Human Performance, and Recreation (HHPR), Family and Consumer Sciences (FCS), and Communication Sciences and Disorders (CSD) - was to support Baylor University's strategic plan, Pro Futuris and Illuminate. After two years of self-study, reflection, and deliberation, and the addition of the Department of Public Health and the Division of Health Professions, the faculty and staff of Robbins College are proud to present this strategic plan. Our vision for Robbins College is to advance the goals of Pro Futuris and Illuminate through increased research productivity, procurement of federal, foundation, and industry grant dollars, increased peer-reviewed publications and creative work, growth of existing graduate programs, and creation of new graduate programs, all while continuing to strengthen and maintain our undergraduate programs. The academic departments in Robbins College have a long and productive history of providing excellent teaching, clinical services, and community outreach in health behavior, health sciences, pre-health professions, and creative professions. Additionally, for the past two decades, programs within the Robbins College have significantly expanded research productivity. As part of the creation of this important plan, several faculty committees were formed to explore the College's strategic direction based on six distinct themes. The following strategic plan is the culmination of countless hours of work by the faculty and staff of Robbins College. It will guide our direction in the near term and help us set a course for the long term to help our faculty, staff, and students flourish. Building on a rich history of leadership, innovation, and achievement from academic programs in Robbins College, the following is our strategic vision.